Camella Bohol offers a panoramic view of the whimsical Banat-i Hill, the only hill in Tagbilaran, the capital and the island’s only city. The homes in Camella Bohol are Mediterranean-inspired with colors that echo sand, sea, ocean birds, and the vibrant vegetation that decorate seaside villages. Camella Bohol, nesting in the island’s capital, is accessible to the province’s major shopping areas, hospitals, churches, schools, and business hubs. 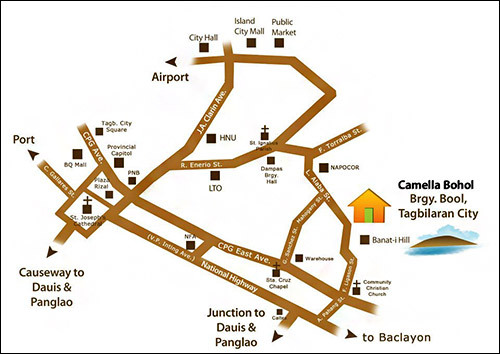 The University of Bohol, Holy Name University and the Bohol Institute of Technology are within 12 minutes away. The Tagbilaran City Community Hospital and Coop Hospital are even closer. 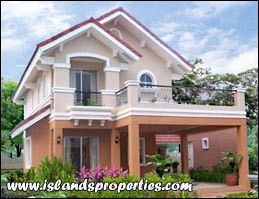 For fun and entertainment, there are the Island City and Bohol Quality Malls, less than 10 minutes from the gates. The airport is an easy 20 minutes away while the seaport is close by at 15 minutes. Baclayon Church and St. Peter the Worker Parish are 10 minutes from the community. Amenities include a swimming pool, basketball court, playground, and pathways. Security is provided by gated entranceways and roving security guards. At the heart is the Community Center, both a clubhouse and a commercial district that would house a grocery, drugstore, bakery, coffee shop, and other services as well as a place for residents to gather.